A very cautious Fed is more confident about the economy, but global headwinds are raising uncertainty about rate hikes. The Federal Open Market Committee (FOMC) kept rates unchanged on March 16, to no one’s surprise. It also noted that it sees rates rising even more slowly than it had indicated in December. 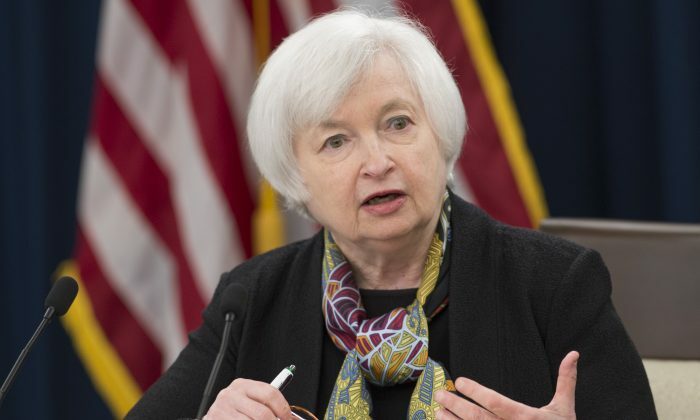 The committee said the U.S. economy has been “expanding at a moderate pace,” but “global economic and financial developments continue to pose risks.” The latter, a new addition to the statement, seemed to outweigh the positives, making for a more dovish Fed. “What they’re saying to me is they have some concern of the U.S. dollar getting too strong if they move prematurely,” says Michael Gregory, Deputy Chief Economist at BMO. Global economic and financial developments continue to pose risks. Gregory tells Epoch Times that the U.S. is more vulnerable now to external developments than at any other time in its economic history. A strong U.S. dollar hurts exports, makes its producers less competitive, and puts downward pressure on inflation. Prior to the greenback’s run-up in mid-2014, exports were nearing record highs as a share of economic output. Now, net exports have been described as “soft” in every FOMC statement dating back to last June. The U.S. trade deficit widened sharply in January, with exports falling more than imports. TD lowered its estimate of U.S. Q1 GDP growth by 0.2 percent in response. But the biggest threat to the U.S. economy comes not from global trade, but from global financial markets. The market plunge in January led to higher chances of a U.S. recession, although that has died down with the calming of the financial markets. And while the Fed is more cautious, Gregory feels the risks of recession are lower now. BMO’s models focus on the two key factors of financial conditions and jobs, both of which have improved. The desire to raise rates gradually is even more gradual than it was in December when the Fed hiked for the first time in nearly a decade. Then, the Fed’s dot plot, which represents FOMC members’ individual projections of appropriate monetary policy (fed funds target range), showed four rate hikes looming in 2016. Now it’s two. The median end-of-year fed funds range is lower by 0.5 percent, meaning 0.75 to 1.00 percent in 2016 and 1.75 to 2.00 percent in 2017. It is lower by 0.25 percent for a range midpoint of 3.00 percent in 2018 and 3.25 percent in the longer run. According to TD Global Strategy, financial markets are fully pricing in a rate hike by November, with the probability of a June rate hike at 55 percent. The labor market keeps improving and is close to the Fed’s maximum employment objective. It has added 230K jobs per month over the past quarter. But one area of improvement remains—wage growth. Fed chair Janet Yellen was somewhat surprised that it hasn’t shown a sustained pickup yet. The second part of the Fed’s mandate is price stability. While the FOMC acknowledged the uptick in inflation, Yellen was questioned about the risk of overshooting the 2 percent target. Gregory believes the Fed is willing to take this risk to avoid the situation where inflation moves lower. “I think the Fed is O.K. with that actually as long as there are meaningful risks of inflation going the other way,” Gregory says. At some point, wages will pick up and pressure inflation higher. The risk is the Fed finds itself “behind the curve” fighting inflation. “They probably aren’t going to get this thing perfectly,” Gregory says. Despite the upgrade to the economy, the Fed sees lower economic growth. GDP growth is projected to be 2.2 percent in 2016, 0.2 percent lower than the projection made in December, and it is projected to be 2.1 percent in 2017. RBC sees a slightly stronger growth outlook than the Fed and three rate hikes for 2016. “We expect evidence of domestic resilience will convince the Fed that the U.S. economy is on a solid footing even if the external growth outlook remains uncertain,” said RBC in a note. But for now, uncertainty dominates, which isn’t what the Canadian economy needs from its neighbor to the South. The loonie rose nearly 2 percent post-Fed announcement. Stock and bonds also rallied, as did gold, perhaps reflecting the Fed giving vibes of increasing uncertainty. Gregory feels the Fed’s latest announcement raises the likelihood of a Bank of Canada rate cut. “Whatever small probability you attach to the Bank of Canada having to mitigate these risks by taking out some insurance—to use their words—that probability, given the Fed today, is a little bit higher. Dec. 16, 2015 marks the first Fed rate hike in nearly 10 years. “Labour market conditions improved further even as economic growth slowed late last year,” said the Federal Open Market Committee (FOMC). OTTAWA—The Bank of Canada kept its key rate unchanged at 0.50 percent on Weds. March 9.